We Own It is leading a campaign to halt Jeremy Hunt’s shameful decision to sell off NHS Professionals (NHSP). Get your MP involved in helping us – see We Own It’s new call to campaigners and MPs here to contact the National Audit Office (NAO). NHSP is the in-house NHS staffing agency and provides a bank of 88,000 doctors, nurses and health professionals willing to work in hospitals and community services across the UK. It’s a big success, saving the NHS £77 million last year alone, by reducing the need for expensive private agency staff. Now, ironically, the government wants to privatise it by selling off a 75% stake. Please get your MP to help – see We Own It’s new call to MPs here to contact the NAO. 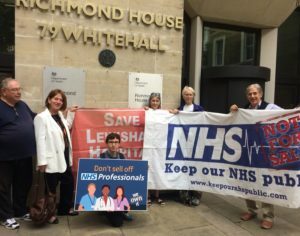 On 25 July KONP supporters from Islington, Lambeth and Save Lewisham Hospital Campaign joined We Own It in delivering their petition to keep NHS professionals public to the Department of Health, it had 16,400 signatures. Since then Labour has called for an enquiry into the government’s intended sell-off and shadow health minister Justin Madders MP has written to the National Audit Office calling for an investigation. Numerous NHS health professionals, trade unions and health campaigns have now joined this request in a letter to the NAO – see here. “This is a valuable, publicly owned service which provides temporary, short-term and flexible staff to NHS Trusts. The NHS spends around £3 billion a year on hiring temporary staff, of which up to 20% goes directly to private agencies as profit. NHS Professionals was set up to help the NHS reduce its reliance on these exploitative private staffing agencies. NHS Professionals saves the NHS £70 million every year because it doesn’t charge expensive commission fees, unlike private agencies. KONP will work with We Own It and others to back the call to stop this irresponsible sell-off. Please contact your own MP immediately, and our briefing may also be helpful for this – see here. If NHS is privatised there will be a serious health problem for the majority of citizens. Such a “sell off” is not only an extremely poor management decision which will endanger the NHS even more than the reorganisation has already caused, it will be yet another service that will be bought up by the “cronies” of government at the expense of the Nation. We know form experience that the “sell off” will produce more profits, less quality and a gradual hike of costs to the NHS just like Rail Services, Energy, Water and telephone services. It is a dishonest use of public services to benefit the few at the expense of the many.